Florida Keys Direct Waterfront Vacation Rental Property located on the Gulf of Mexico. Very Private location on an acre of land. Perfect location for private weddings, corporate retreats, family vacations, and any type of celebration. irect Gulf of Mexico Waterfront Private Estate Size Property w Amazing Sunsets! 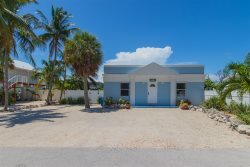 Located in the heart of the fabulous Florida Keys just 50 Miles from Key West, and 100 Miles from Miami International Airport. Here you'll find our private ( Non Pet Friendly ), gated 3 bedroom 2 bath home with an additional separate 1 bedroom 1 bath guest house we call "Serenity Bay". These homes are centrally located on 1 acre of direct Gulf of Mexico oceanfront. View amazing Florida Keys sunsets right off your front porch! The main house has 3 bedrooms with as master suite upstairs that we know you'll fall in love with. The owner has set this home up to give all of her guests the feel of the fabulous Florida Keys while combining all the important elements that our guests look for in a private family vacation home. The separate 1 bed 1 bath guest house is a nice touch for those who need a little more privacy at night but still desire to be "part of the crowd" for all the daily activities. Serenity Bay was set up to provide all our guests with the perfect balance of privacy and convenience. We wanted all of our guests to have a place where they could hold Weddings, Family Retreats, Get-A-Ways and other functions while getting a true appreciation for what the fabulous Florida Keys have to offer! We are excited to announce that we have just added (as of 7/14/16) up to 25' of Deep Water Dockage for all our guests at the marina next door ON US. You can also request additional space if needed and they will work with you as there is plenty available ( entrance to marina 550' from this home's driveway). This also includes unlimited use of their boat ramp, trailer storage, and water hook up for wash down and motor flush . All of this is NOW INCLUDED with your vacation Rental :) Check out our *** NEW AMAZING 50' POOL/Jacuzzi *** it's completed !!! The homes are centrally located on one acre of land directly on the Gulf of Mexico. You'll see beautiful sunsets from your Living Room and Tiki Hut that will take your breath away. Enjoy a spacious interior that you're sure to fall in love with. The owner has set the home up with the feel of the Keys while combining all the important elements you look for in a vacation home. If you need a bit more privacy, the guest home offers a great option. Serenity Bay is set up to provide a balance of privacy and convenience and to provide an excellent venue for weddings, family retreats, getaways, and other functions. Recently, in July, we added 25' of deep-water dockage at the marina next door with unlimited use of the boat ramps, trailer storage, and water hook ups. There's also a new pool and plenty of elegance and style for any vacationer.